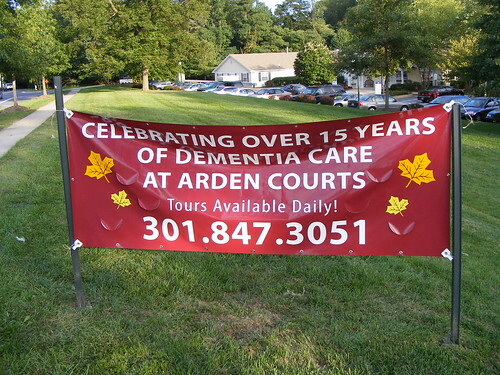 Our subdivision is adjacent to Arden Courts, a retirement home specializing in, well, dementia care. It seemed harmless at first. And Arden Courts was generally a quiet neighbor until we heard the helicopters over our house. Everyone comes out into the cul-de-sac. I heard it was the police, someone says. One of the old people escaped. The kids stifle laughs, newly aware that the best jokes are those you're not supposed to laugh at. Phones ring inside, and on the other end, a voice instructs us to look out for an elderly woman in a pink sweater. It's Alzheimer's. She doesn't know where she is. If you find her, give us a call. We never found her on our street, though someone else probably did and everyone lived happily ever after. It is true that cul-de-sacs discourage through traffic, if people who are lost and disoriented can't even find us.